It took me a while to finish this book, and not just because it’s 540 pages. Granted, the book is not the standard 5.25 x 8.25 and is instead an odd 6 x 7.75, which makes the pages short and stubby. 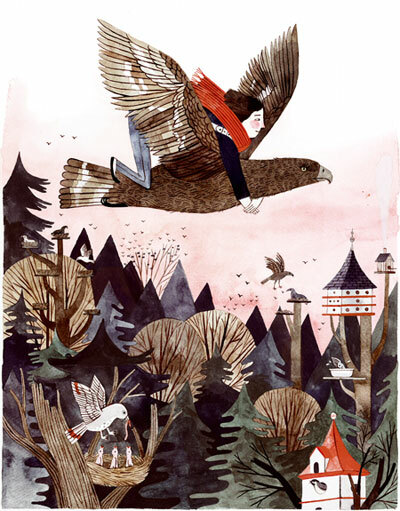 Plus, there’s a smattering of really gorgeous illustrations that I’m tempted to pull out and frame. Still, it’s a long book and I’ll say right now that if it was 200 pages shorter, I would’ve enjoyed it more. When Prue heads into the Impassable Wilderness, the random woodsy acreage outside of Portland, Oregon, she’s followed by a classmate, Curtis, whose awkwardness is palpable yet endearing. Prue can’t shake him, so he joins her in the Impassable Wilderness in search of Mac and that murder of crows. 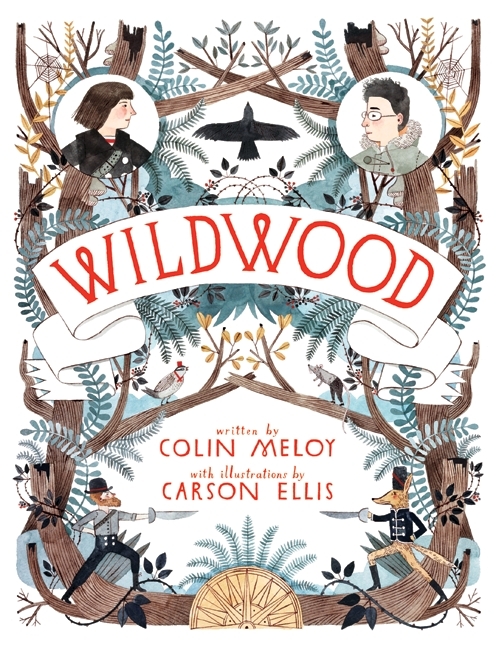 They soon learn that the Impassable Wilderness is called Wildwood, a magical place where animals are talking citizens and they are currently entangled in a civil war. 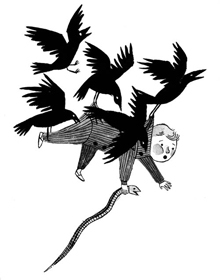 The pair get separated after a run-in with an army of coyotes and they remain separated for much of the book. Curtis is under the influence of the Dowager Countess, while Prue continues the search for her brother and finds counsel among the aviaries. 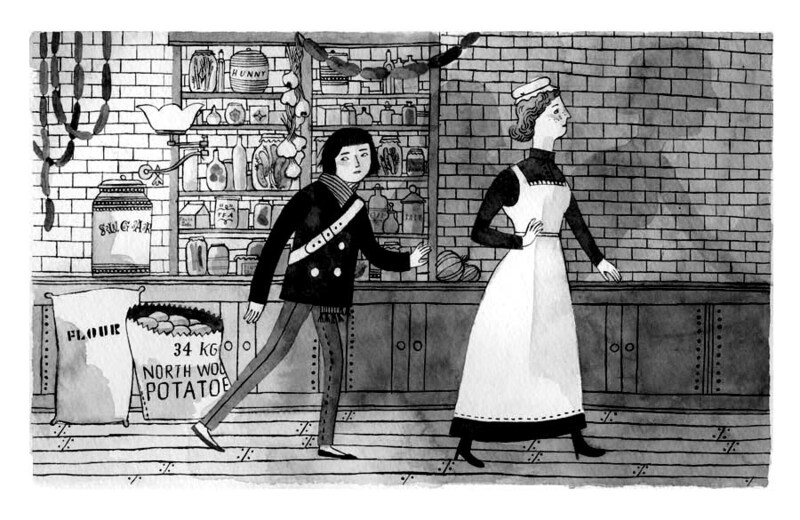 Did I mention how lovely the illustrations are? Eventually Mac is found and a huge background of information unfolds. We find out his abduction wasn’t altogether unexpected. I’ll leave you with that. Did I like it? Well, sure, I guess. It’s a children’s book – I’d say middle grades – so it was easy to read, and I always enjoy a world where animals can talk. Prue is a headstrong girl who’s determined to do the right thing and has no time for nonsense. My kind of girl! Plus who doesn’t love a devoted sister who descends into another world, risking her own life, to save her baby brother? (Um, Labyrinth?). Speaking of, there are very clear reflections of other well-known fantasies (Chronicles of Narnia, the Wizard of Oz), so much that I ended up looking for those parallels within the story rather than enjoying the story on its own. One could argue that there are no original stories, that every work is derived from ancient tragedies and comedies, but it’s far too easy to read Wildwood and think, “Wow. Curtis and the Dowager are just like Edmund and the White Witch.” It’s unoriginal to distraction. Yet, maybe that’s the point. Maybe Meloy wanted to weave these themes and tropes together to capture their all-encompassing magic into one work. Maybe he wanted to harness the essence of Portland and expand it through enchantment. Maybe he wanted children to experience a soft opening to other fantasies while letting adults sink in with familiarity. I dunno. How’s that for literary criticism! Speaking of the author, one of the reasons I wanted to read this book (aside from its gorgeous cover) was because Colin Meloy is a singer/songwriter and member of The Decemberists, a folksy band out of Portland. I enjoy their music, so when I heard one of the band members was writing fiction in his down time, I was all over it. My final verdict is that Wildwood was lovely departure from reality and it came along at the right time in my stack of books to be read. The distraction from real life was necessary, and even though it dragged in some parts, I was still curious enough to know whether or not Prue would ever find her brother, what would become of Curtis, and whether or not Wildwood would be exposed to the outside world. There are two other books in the series, and though I don’t have them yet, they are on my list to purchase – if only for the illustrations.